There are movies that give you the impression the actors/actresses were having the time of their lives making it. Sneakers is a prime example of this. I am used to seeing Ben Kingsley (my favorite actor) portraying a historical protagonist (in the movies "Ghandi", "Schindler's List", "Joseph", and "Moses". This is the first time I've seen him as a bad guy, and he does an excellent job at this. I saw this movie when it was originally released and was enthralled by it. The technology, at that time, was somewhat cutting edge, gee whiz type stuff. It's been many years since that original viewing, but seeing the movie in HD brought back memories. Some of the equipment (acoustic coupler anyone?) is so dated now, but some of it still would be considered hi-tech even today. Perhaps the biggest thing 'dating' the movie is the amount of money tossed around as the dollar amounts would be laughable by today's standards, and should be laughable by even the standards from when the movie was made (1991), but that was quite some time ago. There were also many different stars crammed into this movie, including the President from the reimagined BSG (Battlestar Galactica) showing up in a supporting role. 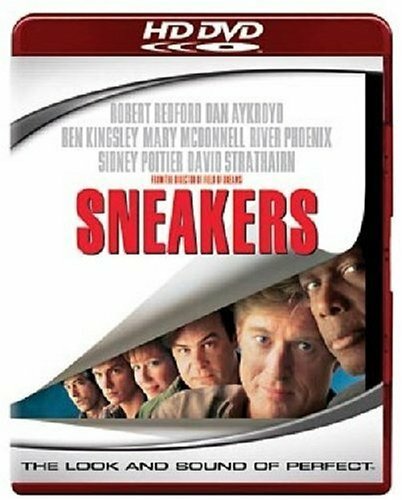 While Sneakers boasts an incrediblely talented ensemble cast, the focus in this fun movie is never on just one character for too long of a period, and the result is a great escapist tale, and truly entertaining as well. There are so many great moments contained in Sneakers that it takes several viewings to really understand just how fine those moments are! David Strathairn's "Mother" character really stands out, and the scenes where he slowly begins putting together a simulation soundtrack as to what Redford's character "Marty" heard while kidnapped and in the trunk of a car, are spellbinding! Spellbinding as well is the performance of Ben Kingsley, who takes his time getting to the screen, but it's worth the wait as he ever so slowly steals the movie away from the rest of the cast. His "chat" with Marty, where he, "Cosmo," finally reveals himself to Marty, and then launches into a discourse of what the real world, in his eyes, is really like and all about, is stunning! This is one of his best performances, and while certainly not his longest, it's incredible to watch him more than hold his own with Redford in their scenes together! Timothy Busfield's turn as a bad guy is great fun, similar to but much more sinister than his brother-in-law role in Field Of Dreams.....here's hoping he gets the opportunity to take on some more of these types of roles in the future. And what a treat to see an actor the calibur of Sidney Poitier in this one......he certainly has his fine moments here as well, and the scenes that showcase his ability to be greatly agitated yet under complete control all at the same time are pure acting lessons! One of the greatest caper movies ever looks the best it ever has! I really enjoy this movie, and was very happy to see it released by Universal on HD-DVD. This movie has a lot of big names in it, and they really deliver. It has great suspenseful moments, international intrigue, a believable plot, and a lot of humorous moments that are actually funny! There are plenty of other places to look if you are looking for a synopsis of the movie, including the standard DVD page, so I'll leave it to them to tell you about the movie if you don't already know it. My review here will be about the HD transfer itself. Overall, I was really impressed! It's a definite jump from the standard DVD, even upconverted. I might even go so far as to say that some selected scenes look incredible. Most of the scenes in Sneakers are dialogue, and a lot of people in them, and I noticed that the clarity of people's faces and eyes was great. The shots of the buildings, and the Scrabble tiles being rearranged I thought were great. For the most part though, the PQ is good, but certainly not demo material. There is definitely some grain noticable, but I was happy to find it wasn't distracting. Even in some of the darker scenes where I expected some heavy grain, the grain was only noticable, not obtrusive. The sound is also excellent. I don't know if it is better than the S-DVD, but I had no complaints with the 5.1 soundtrack. Sure I would have loved me some lossless audio, but I didn't expect it and it isn't really a big deal to me that it isn't there. I have only 2 complaints about this disc. First, I wish Universal had cleaned it up a bit better. There were a fair amount of "flecks" floating through the picture throughout. Of course, once I stopped focusing on the picture and enjoyed my movie, I didn't notice them except for a few brief moments, but they are definitely there. Is it hard to clean the master? I was a bit disappointed in that area, as most films in HD are extremely clean, with flecks only occasionally. These were fairly constant. My second complaint is extremely minor and more personal, but I wish there were some Spanish subtitles. Overall, I am very happy with this disc, and would definitely recommend the purchase to anyone who enjoyed the movie. It's a definite improvement from the S-DVD. It's certainly not a movie I'd pop in to show off my TV for friends, but then I never expected that. The only thing that I wish had been done differently would have been for a cleaner transfer, removing some of the larger and more noticable flecks. Sleeper Thriller, Fun,Good wins over Evil on Widescreen DVD! Summary: The Redford Security Expert Team is hired by the NSA (National Security Agency) to recover the ultimate BLACK BOX from a powerful corporate magnate villian (Kingsley), who happens to be Redfords old college friend. This Black Box can decode any program!! All turns out not so friendly and the techno cat & mouse game thriller begins. Both my 12-year-old son and I enjoyed this movie. Great actors/actresses who looked like they were having fun filming it. The movie looks a bit dated vis a vis technology, but it's still fun. If you have not seen Sneakers, where have you been hiding? Robert Redford leads this all star cast, an emsemble that blends effortlessly for so much talent in one room. Sneakers combines good character with interesting plot, suspense, humor, and romance. Delightful caper flick enhanced by its deft handling of a rather preposterous plot. Great characters and terrific casting (Dan Aykroyd's conspiracy theorist perpetually sparring with ex-CIA agent Sidney Poitier, Ben Kingsley brilliant as usual, etc.) plus a really good score. The technology in the movie is completely dated but it holds up anyway. One of my favorites. ...well...back in the early 90's, this movie was one of my favorite. Time passed and since all dvd were low quality, I didn't get a chance to see this movie since then. I saw this movie in the theaters back in 1992 and it was great. It is timeless in that everything about the security and technical issues outlined in the movie are relevent today if not more. When Cosmo states" it's all about the information, what we hear, see, etc.." is so right on in our over connected world of the internet, cable news, podcasts, cell phones, camera phones, intrusive web cam/phone technologies, blogs, wirless, blackberries, rfid, youtupe, myspace, online ecommerce, protocols, protocols and more protocols. It is all about the network today and the information that flows through it. Do you remember how your life was pre 1995 internet and cell phones? Can you imagine your life without your various access points to the internet, its content and your cell phone? Cosmo was wrong when he said it is no longer about energy, it is still today for without the energy you have no means to propogate the information. They nailed it then and it is relevent today. Scary. One of my top 20 movies of all time. if you are as big a fan of Sneakers as I am, you will know what i am talkiing about when I say "hell yeah!" Honestly I haves een this movie more than 20 times and it keeps getting better. Redford! Poitier! Ackroyd! Phoenix! McDonnell! Strathairn! Kingsley! Tobolowsky! Busfield! Do these names mean anything to you? they mean the world to me! Now I'm not some saleman or some guy who worked on the movie and is trying to get you to run out and buy it... nor do i work at amazon.com, but I URGE to to see this movie. Comedy, suspense, touching love story, good buddy flick and a slammin' soundtrack! you get to the end and they make it into a kind of joke. This is unfortunate: you get a very scary plot, of this chip that is so valuable in what it can do that holders of it are automatically offed, but then they decide to, well, you have to see it to lose your faith in the film's plausible impossibility. (OK, I don't want to be the spolier, but criticism is due). Before that silly ending, the suspence is wonderful and believable. Redford is totally convncing, as is his old friend (Kingsley), who went to prison insead of him by chance. They have this wonderful duality that you find n fiction, good and bad from experience and luck of the draw, and are now deadly enemies. You get these wonderfully unorthodox solutions, such as the blind man helping Redford to find where he had been taken by the sound he remembers while blindfolded in a car trunk. There are many touches like that, splendid details. Then there is the caper, which is complex and frightening, with bad guys you could believe you would want to avoid. It is great - 5 stars - right up until the ridicoulous finale, which ruins the whole thng. Great fun - great actors! Stephen Tobolowski gives a fabulously over-the-top performance as Dr. Werner Brandes, defining a new phase in his career as an unparalleled supporting actor. He gives the role unprecedented depth and importance; let's not forget, Sneakers was made just a year before Groundhog Day. We all remember Tobolowski's astounding portrayal of insurance salesman Ned Ryerson! Do you really believe that that performance would have been possible without his appearance in Sneakers? I believe that the excellence with which Tobolowski created his role helped drive others in the cast to give equally stellar performances; not to be outdone, David Strathairn gives a particularly compelling performance as "Whistler" that is both dirty and idealistic. He and Dan Akroyd's "Mother" pair to make an incorrigible but loveable duo with a one-two punch!